Unspecified in Bible text. I have made it very early morning, the sun is just above the trees in my scene. Sunlight from behind the trees back lights this scene. Three Egyptian soldiers throwing Hebrew baby boys into the river Nile. I found this picture quite a disturbing scene to draw & colour. 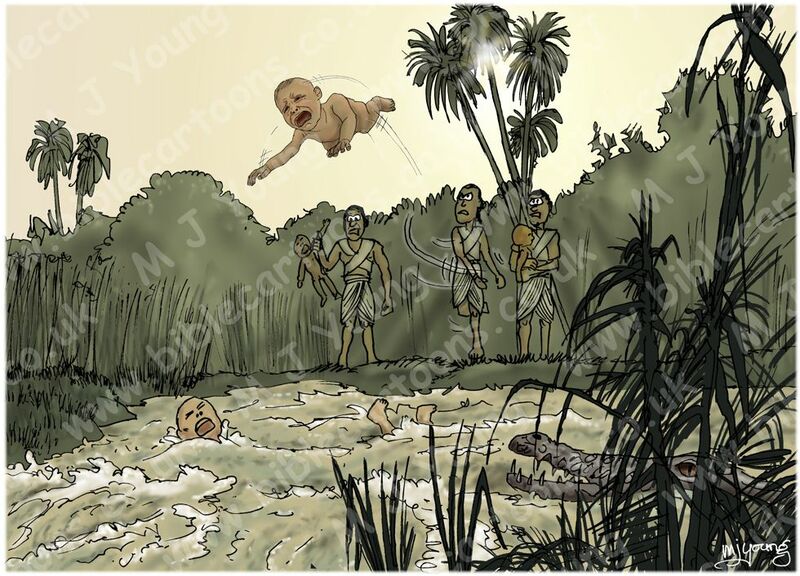 The idea of throwing babies into a river would be abhorrent to most people, but not the king (Pharaoh) of Egypt – what a wicked man he must have been. I decided to draw a Nile Crocodile (Crocodylus niloticus) lurking among some reeds to add additional menace to the hopeless situation of the baby boys.